Emil Sembach was born April 2, 1891 near Greinburg, Austria. 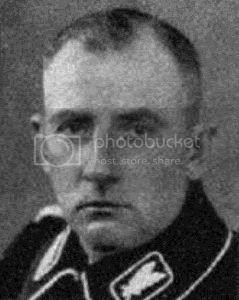 He was an SS Oberführer (Senior Colonel) of the SS headquarters of Silesia. In 1934, after being caught by Reinhard Heydrich's Sicherheitsdienst (SD), for embezzlement and also for having a homosexual relationship with Kurt Wittje, he was expelled from the party and the SS. Fearing for his life he asked Minister of the Interior Wilhelm Frick for protection, but his protection could not save him when on the Night of the Long Knives Sembach was arrested on the orders of his rival Udo von Woyrsch, and the next day under the command of SS-Hauptsturmführer (Captain) Paul Exner, Sembach was taken to the mountains and executed on the orders of Von Woyrsch.